We’ve seen how pronated feet can wreak havoc on the knees as strong valgus shearing forces strain tendons, cartilage, and ligamentous tissues. 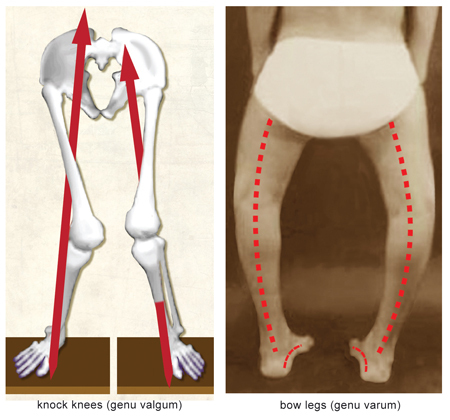 Conversely, reduced shock absorption from high-arched feet can compensate up the kinetic chain causing a varus (bowlegged) shear force through the knees. In time, this abnormal ankle alignment disrupts the tibiofemoral joint’s antigravity function. 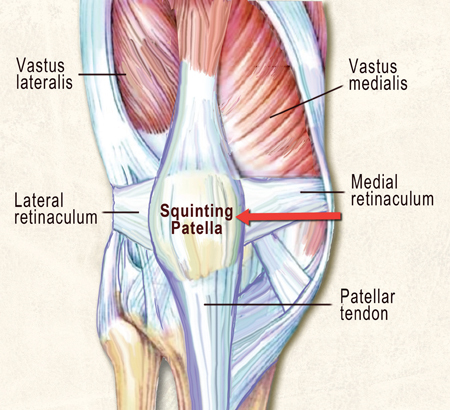 During clinical assessment we commonly see a squinting patella co-present with a chronically elongated medial and a tight lateral knee retinaculum. This sturdy retinacular band provides a perfect anchor for musculofascial attachments; therefore, it is most vulnerable to length-strength imbalances in and around the hip, leg, and foot. During gait, the slightest abnormality in the foot and ankle’s stirrup spring system (SSS) can alter antigravity function, resulting in knee and hip compensations. In the presence of prolonged foot pronation, many global and core muscles forget how to “turn on” and “shut off” in proper sequence. Faulty peripheral input leads to faulty cortical processing and altered motor output. Meanwhile, the cerebellum valiantly attempts to correct the person’s coordination and balance problem by triggering spinal reflexes and accompanying reactive muscle guarding. These effects can, in turn, trigger Movement Pattern Dysfunctions (MPDs). Simply stated, MPDs are imbalances in the movement of our bodies and present another complicating factor in knee pain assessment. MPDs can be large. They can be small. 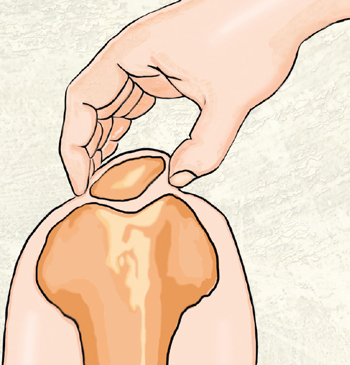 They can cause or be caused by knee pain. If someone limps, her brain is adapting MPDs to avoid further injury, while simultaneously allowing the body to carry on with daily living. MPDs are complex, motor-learned programs ultimately governed by the brain. These ingrained faulty movement patterns develop from muscle imbalances, joint restrictions, poor stability, or previous injury. 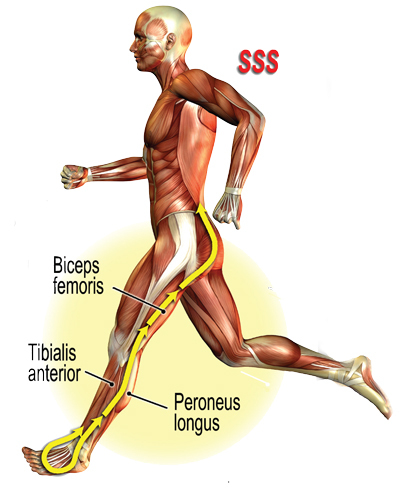 In those clients presenting with runner’s knee, there may be multiple biomechanical imbalances at play. The most common involve the hip and ankle joints. So, instead of directing treatment to the knee itself, I first assess and treat MPDs originating at the client’s hips, ankles or feet and then address knee alignment and mobility issues as shown in the Log Roll technique demonstrated in the video and described below. MAT therapy, along with a well-designed and executed corrective exercise program such as Paul Kelly’s soon-to-be-released PhysioKinetix Training (PKT), helps restore and maintain the movement quality of joints. Ultimately, this treatment will reduce MPDs, and permit the body’s natural healing processes to restore function in those clients with runner’s knee pain.